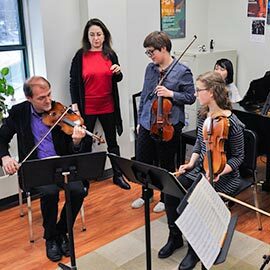 WATERLOO – Wilfrid Laurier University will welcome three young-artist quartets to Laurier’s Waterloo campus from May 27–June 7 as part of the 23rd Quartetfest, an international intensive chamber music workshop featuring performances by the Penderecki String Quartet (PSQ) and the Lafayette String Quartet (LSQ). A series of concerts and multiple chamber music workshops will be held throughout QuartetFest, a non-profit event that helps young musicians from around the world refine their talents. These aspiring professional chamber musicians will travel from across Canada and abroad to learn from Laurier’s Penderecki String Quartet and guest instructors, the Lafayette String Quartet from the University of Victoria and the Nachoff Trio from New York City. QuartetFest offers intensive one-on-one coaching sessions to its young artists along with an accompanying professional concert series. The five QuartetFest concerts will include performances from the QuartetFest Young Artists, Penderecki String Quartet, and guest instructors, the Lafayette String Quartet. The PSQ and LSQ, which are in the top tier of outstanding chamber ensembles in Canada, will also perform together as an octet. The 2015 Young Artists of QuartetFest include the Concertato Quartet from Talca, Chile and two Canadian quartets (Noseworthy and Montoya Quartet) comprised of students from Laurier’s Faculty of Music, University of British Columbia, Memorial University and Western University. Friday, May 29, 8 p.m., Registry Theatre: PSQ with Quinsin Nachoff Jazz Trio, featuring Winnipeg composer, Diana McIntosh. Tuesday, June 2, 8 p.m., Kitchener Waterloo Chamber Music Society Music Room: PSQ with Pamela Highbaugh-Aloni (cello). Friday, June 5, 8 p.m., Canadian Clay and Glass Gallery: LSQ with PSQ’s Christine Vlajk (viola). Saturday, June 6, 8 p.m., Kitchener Waterloo Chamber Music Society Music Room: QuartetFest Young Artists. Sunday, June 7, 8 pm., Kitchener Waterloo Chamber Music Society Music Room: Quartetfest Young Artists, along with winner of the PSQ prize. For a full listing of concerts, program details and ticket information, visit www.quartetfest.ca. Ticket subscriptions for all QuartetFest concerts can be purchased through the Kitchener Waterloo Chamber Music Society (KWCMS) by visiting www.k-wcms.com.